Twenty years ago this week, West Indies batsman Brian Lara broke Sir Garfield Sobers's 36-year-old world record for the highest score in a Test innings. The legendary left-hander surpassed his compatriot's 365 not out as he scored 375 against England at Antigua's Recreation Ground in a historic match played from 16-21 April 1994. 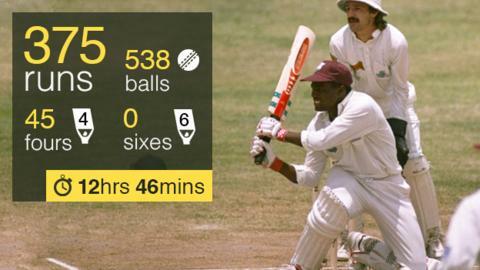 BBC Sport spoke to those who witnessed his world record innings close up: two of Lara's West Indies team-mates - Phil Simmons and Shivnarine Chanderpaul - and five England players who suffered in the field: Angus Fraser, Jack Russell, Phil Tufnell, Graham Thorpe and Alec Stewart. England went into the final Test of a five-match series on a high after becoming the first touring side to win in Barbados for 59 years in the previous Test, even though they were 3-1 down with the series gone. After losing the toss and being asked to field on a flat-looking wicket, England reduced the Windies to 12-2 - leaving Brian Lara and Jimmy Adams at the crease. Phil Tufnell: Spin bowler, 42 Tests, 121 wickets at 37.68. Former England fast bowler Angus Fraser: "We had lost the first three Tests and everybody was talking about a whitewash, and then we managed to win in Barbados. That was certainly a career highlight for many who played in that game - I got some wickets (8-115 in the match) and Alec Stewart got a hundred in each innings. It meant a dead series suddenly came to life." Ex-England wicketkeeper Jack Russell: "When we got a couple of early wickets, I started thinking 'this is going alright, we'll knock this lot over and won't be out here for too long...'"
Fraser: "Things were looking quite positive but then Lara got in and just batted." During the remainder of the first day, Lara took West Indies to 274-3, advancing his score to 164. Former England batsman Graham Thorpe: "He kept the same pace throughout his innings, there didn't seem to be a single risk taken in it. There was an inevitability about it all." Russell: "The ball never looked like missing the middle of his bat." Ex-England spinner Phil Tufnell: "I bowled my first over and was putting my jumper back on when Mike Atherton, the England captain, came over to me and said: 'Brian's batting well today, he might break the record.' He was only on 60! Athers was a clever bloke and he got it spot on." Lara continued to pile on the runs, reaching 320 not out by the close of the second day. At the other end, he had been joined by 19-year-old Shivnarine Chanderpaul, who was playing in his debut series. West Indies batsman Shivnarine Chanderpaul: "He was probably the most focused I have seen him. He mentioned the record while he was in the dressing room and he was getting a lot of phone calls about it, but he always remained focused." Former West Indies batsman Phil Simmons: "The biggest thing I can remember was his determination, from not being out on the first day, to get that record. You could see it in the way he was batting." Fraser: "We realised the record was on quite early because of the nonchalant way he went from 100 to 150 to 200. Once he got to about 250, you begin to wonder where it was all going to end. By that stage you have tried all your tactics and your variety, it has not really got you anywhere and it begins to boil down to if he will make a mistake." Former England batsman Alec Stewart: "At tea, his bat looked about three feet wide. The closer it got, even though I wanted to get him out every ball, you began to realise you were watching a historic achievement close up." Simmons: "Throughout the innings, he remained the same - he'd come into the dressing room, relax and five or 10 minutes before it was time to go back out he would strap his pads back on and begin to focus again." Tufnell: "He seemed to score in blocks of 10s and 20s: you would look up at the scoreboard and you would be wondering where all the runs had come from because there were no big, powerful shots. It was just sublime batting." Calypso cricket, Lara cruising. Sledge time? Fraser: "He was too good a player to sledge. You were wasting your time. It all comes down to who has the biggest gun and you don't have it, so you just sometimes have to accept you are playing against somebody bigger and better than you are." Chanderpaul: "I can't remember England trying to get under his skin, but that's probably because nothing was going to put him off." Russell: "There was never any arguing or sledging with the West Indies. They were so good they just got on with their cricket. With Lara, you didn't want to fire him up." Fraser: "The energy within the crowd was brilliant. Antigua is a small, intimate ground which only holds 10 or 11,000. It's not in a great state of repair but it's full of character. "There was a little double-decker stand which was packed. In it was a DJ called Chickie, who played music between every ball and every over, it was real Calypso music. The whole stand would be shaking with people dancing and bouncing up and down. It was an amazing spectacle. "I fielded down there and there was some playful jip. It was great fun and never boring." Lara was 320 not out at the start of the third day, still 46 runs away from breaking Sir Garfield Sobers's world record of 365, for West Indies against Pakistan in Jamaica in 1958. Fraser: "We were aware of history potentially being made but I wasn't aware of the stuff happening behind the scenes with Garry Sobers being brought to the ground. Television crews were setting up for something significant happening. It was the third morning when he had a little dodgy period and I had to remind him not to throw it away." Thorpe: "We heard he had played nine holes of golf that morning, so he was pretty relaxed." Stewart: "As he got closer to the record, we were trying to keep him off strike. The field did come in, but only when he drew level with the record." Tufnell: "I had a quick word with Chris Lewis and told him to make him do something to earn the runs - don't just give him one off the hips so he can clip it. Chris decided to bowl him a bumper and he just pulled it away with ease and then the whole place erupted." As supporters rushed on to the pitch, Sobers, the man who had just lost the world record to Lara, walked to the middle to congratulate his compatriot. Chanderpaul (who was still batting at other end): "It was the most exciting thing I have ever witnessed. The moment was so big for everyone who was around. Once he scored the boundary to break the record, it was difficult to get near him to celebrate with him but he came to me and then we went off to meet Sir Garry [Sobers]." Simmons: "It was emotional when it happened, the biggest thing was that the previous record holder was there to congratulate Brian. For the record to stay in the West Indies, it was great. It was done by a son of the soil. Sir Garry appreciated that." Sir Garfield Sobers said at the time: "I don't think a better person could have broken my record." Fraser: "The whole place was rocking. There were people climbing over the fences and running onto the field doing cartwheels and headstands. As a fielder, you take your cap off because you know it's a good souvenir and you don't want somebody to run past you and nick it off your head!" Simmons: "We weren't expecting to see the crowd run onto the pitch but there was nobody to stop them - the policemen were enjoying themselves too." Tufnell: "I think there was a fella selling corn soup down at third man. Mid-on was selling chicken wings and somebody turned the music up. The place went ballistic. It took about 20 minutes for it to calm down. "I was almost proud and pleased to be involved in the occasion. I just went and sat down at mid-on and enjoyed the sunshine and the moment." Fraser: "I remember Darrell Hair, the umpire, telling somebody off for walking up and down the pitch. It was the groundsman." Hang on a minute...wasn't Lara almost out? Russell: "When he went past the record, he hit the stumps. The ball was over the boundary rope in a flash, but I remember the bail going up in the air because he had knocked it with his foot or his pad. "As the ball travelled to the boundary, I was watching the bail and realising I would need to appeal if it fell off. I also thought to myself that if I do appeal, I won't make it home - I'll be lynched. The bail didn't fall off in the end but it stayed slightly out of its slot." Fraser: "With all the chaos, nobody knew what was going on and who anybody on the pitch was. "The most surprising thing was eventually, when the ground had been cleared, Chris Lewis went to the end of his mark to finish his over and he asked where the ball was. Despite the carnage and thousands of people out on the field, the ball was still resting against the boundary board where Lara had hit it. Fraser 43-4-121-2, Caddick 47.2-8-158-3, Tufnell 39-8-110-0, Lewis 33-1-140-0, Hick 18-3-61-0. "It would have been a great souvenir for somebody but, at the end of the innings, I got the ball and asked all of the England bowlers to sign it and presented it to him. Whether he still has it, I have no idea." Lara was eventually dismissed for 375, caught behind by Russell off the bowling of Andrew Caddick. His innings lasted 766 minutes (12 hours 46 minutes), 538 balls and he scored 45 fours but no sixes. Russell: "It's important to keep your concentration because he did edge one to me eventually. Two and a half days later!" Chanderpaul: "At the end of that day, the dressing room was a very happy place to be. Everybody was out celebrating and having some fun. It was an exciting moment and I enjoyed it as a young fella just coming into the side in my debut series." Later that year, Lara would spend the summer as Warwickshire's overseas player. On 6 June, he set a new world record for the highest first-class score of all time. The 501 not out made against Durham is yet to be bettered. Lara lost his Test world record to Australia's Matthew Hayden when the opener scored 380 against Zimbabwe in Perth in 2003. However, he reclaimed the record when he scored 400 not out against England in Antigua in April 2004. Stewart: "He's the best player I have played against. I'm splitting hairs between him and Sachin Tendulkar but I have always just put Brian at the top of the tree because he would destroy a bowling attack and, when you set fields, he would put the ball where you have just taken a fielder from. His appetite for run-scoring, while also taking the attacking option, makes him stand apart." Fraser: "You look at the top 15-20 innings that have ever been played and this fella has made half a dozen of them." West Indies 593-5 & 43-0 drew with England 593 all out (R Smith 175, M Atherton 135). Thorpe: "I got to watch a lot of his innings from side on and I put a lot of my style, when I became aggressive and pro-active, down to watching great players like him. I looked at the little bits, like his foot movement, his backlift. He had everything as a player. What set him apart was his ability to get two world records and bat for that length of time." Russell: "Lara would bat and bat but he would kill you by scoring so quickly. The game would race by because he'd score two or three boundaries an over and you couldn't do anything about it. He's one of those players who when he bats, you stop what you are doing."